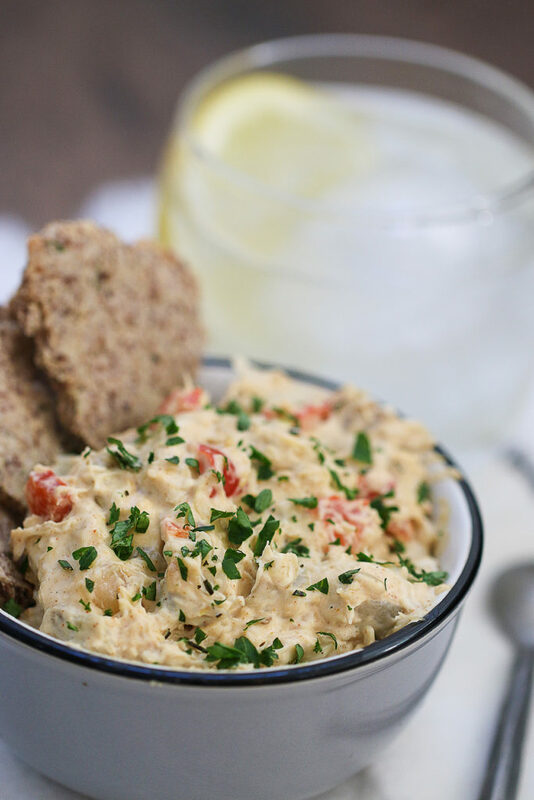 Football food, party dip, creamy, dreamy and rich, this dip will satisfy even the most skeptical person who doesn’t think low carb can be yummy. Bring this to the Super Bowl party, and the bowl will be licked clean. If you’d like to make it extra creamy, add a third 8-ounce package of cream cheese. The cream cheese will be much easier to stir if you bring it to room temperature first, so try to remember to take it out of the fridge an hour before you make this dish. Also be sure to use actual prepared horseradish root (it’s called “Prepared Horseradish” on the jar), and not creamy horseradish sauce. In a flat bottomed non-stick sauté pan over medium high heat, heat up olive oil until warm and shimmering (or you can use a slow cooker if it has a sauté setting). Cook the onion and bell pepper until soft, about 6-7 minutes, stirring often. Stir in artichoke hearts, let cook an additional 2-3 minutes. Remove from heat and transfer to slow cooker (or switch slow cooker to Low). In a large mixing bowl, combine cream cheese, parmesan, fontina, crème fraîche, prepared horseradish, Tapatio, Dijon mustard, lemon zest, and anchovy paste until creamy. In a smaller bowl, whisk together salt, white pepper, ground ginger, smoked paprika, and celery salt. Pour into large bowl and evenly blend in the spice mix. Gently fold in the crab. Pour entire mixture into slow cooker and gently fold in the sautéed onions, peppers, and artichoke hearts. Cover slow cooker and let cook for 1 hour on Low. Turn slow cooker to Warm, remove cover, and serve in slow cooker or a heated chafing dish along side sliced veggies and Almond Flour Pita Chips from Eat Happy or Rosemary Thyme Pita Chips from Eat Happy Too.